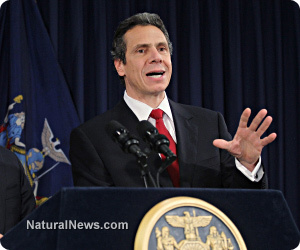 (NaturalNews) If you want to know why Native Americans were once relegated to a second-class existence in our country, why early Chinese and Irish immigrants were abused and discriminated against (legally) and why blacks were still denied full privileges of citizenship even after the Civil War, you need not look any further than the governor's office in the state of New York. Because, in the person of Andrew Cuomo, a progressive Democrat who has essentially said he has no use for those who disagree with him politically, you have precisely the kind of tyranny that our founding fathers sought to temper. Their problem is not me and the Democrats; their problem is themselves. Who are they? Are they these extreme conservatives who are right-to-life, pro-assault-weapon, anti-gay? Is that who they are? Because if that's who they are and they're the extreme conservatives, they have no place in the state of New York, because that's not who New Yorkers are. There are several problems with this overly broad characterization - some of it is completely untrue - but at their core, Cuomo's comments demonstrate perfectly the attitude that led to abuse of minorities through the annals of our history, despite the adoption of founding documents which declared that all are "created equal." In New York, conservatives are in the political minority, though the state has elected Republican governors in the past, as well as Republican mayors of the state's most populous (and generally left-leaning) city, New York City. Cuomo has essentially said that minority a) won't be fairly represented by his administration; and b) are not welcome anyway. Wasn't that the same attitude that led to corralling of American Indians on pathetic reservations? Isn't that the attitude that led to "anti-Chinese" laws out West? Isn't Cuomo's hateful diatribe demonstrative of the same kind of close-mindedness that kept blacks in "the back of the bus" and drinking from separate water fountains? To Cuomo, if you're a political opponent, your voice doesn't count. Your opinion doesn't matter. Your point of view is wrong and extreme. By your very existence, you are a cancer not simply on the body politic but on New York society. By default, he is saying that political opponents should be removed from his state. Maybe Cuomo should change his surname to Stalin. Needless to say, conservatives in New York (and elsewhere) took umbrage with the New York governor. "It's hard to believe that he really believes that," said billionaire mogul Donald Trump, who says he will be deciding soon whether to run for the governorship of New York. The New York Post reported that Westchester County Executive Rob Astorino, who has also promised an announcement next month on whether he'll run for governor, called Cuomo's comments "just the kind of intolerance that is directly opposite to what Dr. Martin Luther King Jr. preached." "New York already leads the nation in chasing away its own citizens because of extraordinary high taxes, so does Cuomo really want to bully millions more away?" Astorino continued. "New York's greatness comes from accepting people of differing points of view. What Andrew Cuomo has revealed by these statements is his true self, because we see just how angry and radical his views are." It is clear that the governor was making the observation that an extreme right candidate cannot win statewide because this is a politically moderate state (either moderate Republican or moderate Democratic). Only, what is "clear" is the language that the governor initially utilized to make his point - and given his stance on such issues in the past, it is obvious that he was merely speaking his mind at a moment when he let his discretion lapse.